I have just posted about my other feline, my black cat Cloé, but I do have another one. 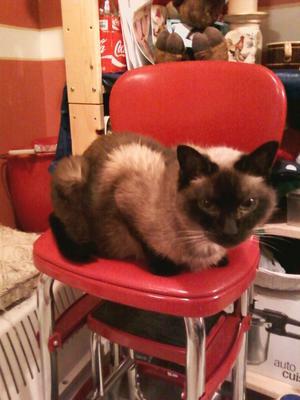 Her name is Pebbles, she is a mixed siamese cat, and I am not exactly sure how old she is. I have had her for 17 years at least, and she was around one when I got her. She still is very beautiful and still eats, jump on the dryer, on the bed and can still walk up and down staires. I think she is pretty amasing. She has always had this graceful walk and posture, I guess it comes from the siamese cat. They are right when they say this breed is one of the most talketive, she will let me know if there is no more water or food in the dish. Sometimes I think she gives me heck, because her voice changes and she want stop talking. 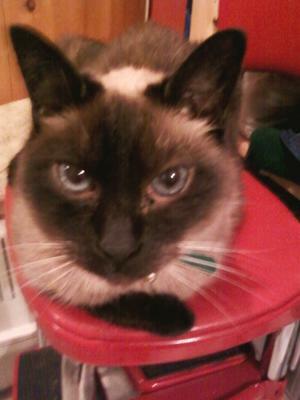 They also say siamese cats have one master and she follows me everywere. 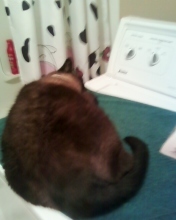 She as been loosing weight lately even if she eats, I will have to bring her to the vet to get her check. By what I have been reeding, it looks like she might be diabetic or have something wrong with her kidneys. She dosen't seem to have to much pain, but she is also getting older and I'm afraid she might have to go join my old dog Misty in kitty & doggy heaven. Well I hope you folks enjoye her pictures and the one of my black cat Cloé. Ya'll have a good day! Here's Cloé's story and pictures. I'm guessing from her age that the problem may be with her kidneys. She may have to go on a special diet. thank you Amanda, I'm trying to think positive, but I will get her check just to be sure. Chloe and pebbles are both adorable. I'm sure pebbles weight loss is nothing to worry about. She has pretty blue eyes and sounds like a kitty with character.